In 1800, the Joint Committee on the Library—the oldest continuous Joint Committee of the U.S. Congress—was established and the Library of Congress was created. At that time, Congress appropriated a small amount of money to begin buying reference books. The city of Washington, D.C. was in its infancy and was devoid of public libraries. Members of Congress and their staffs had no research materials available to them in the nation's capitol. The Library of Congress, therefore, was established out of necessity. The small library was housed in the U.S. Capitol Building until 1814. In August of that year, British troops set fire to the Capitol and destroyed the contents of the library. Within a month, former President Thomas Jefferson offered to sell his personal library—then the largest personal collection of books in the United States. On January 30, 1815, after much debate and a touch of controversy, Congress purchased Jefferson's library for $23,950. 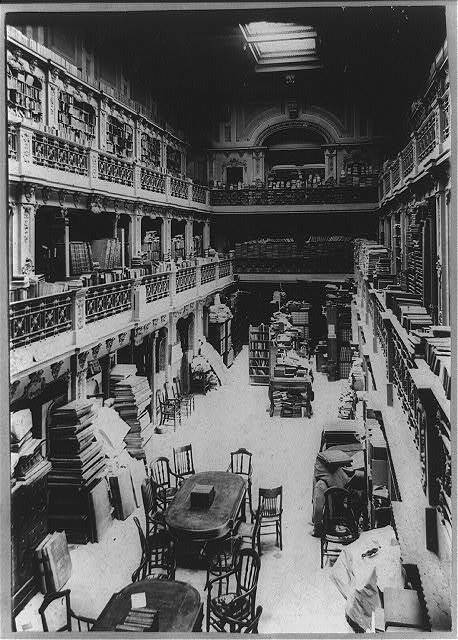 Interior view of the old Congressional Library in the U.S. Capitol Building c. 1897. Photo via Library of Congress Prints and Photographs Division. The 6,487 volume library—double the holdings that were lost in the fire of 1814—has today grown into the largest library in the world. In 1897, the collections managed by the Library of Congress moved from the U.S. Capitol Building to the the Thomas Jefferson Building. The day-to-day structural, mechanical and grounds care of that ornate facility is under the direction of the Architect of the Capitol (AOC). The Library's ever-increasing collection is now housed in three buildings on Capitol Hill and a number of climate-controlled facilities outside of Washington, D.C., including storage warehouses in Fort Meade, Maryland, and the award-winning Packard Campus of the National Audio-Visual Conservation Center in Culpepper, Virginia. "To ensure that Library personnel, visitors and the collections remain safe, a variety of work is done by the AOC that is often unseen by the general public," said Library Buildings and Grounds Superintendent Larry Brown. At the Library, AOC is diligently working to upgrade and install fire protection and life safety systems to equip these historical buildings with the systems required by current building codes. These systems provide detection, suppression and alert occupants of a potential fire using audible and visual alerts. Recently, AOC plumbers installed a fire protection system seamlessly into the historic fabric of the Thomas Jefferson Building. The West Main Pavilion, the most historically sensitive area of the building, highlights the detail and forethought carried out by AOC during the installation of these systems. 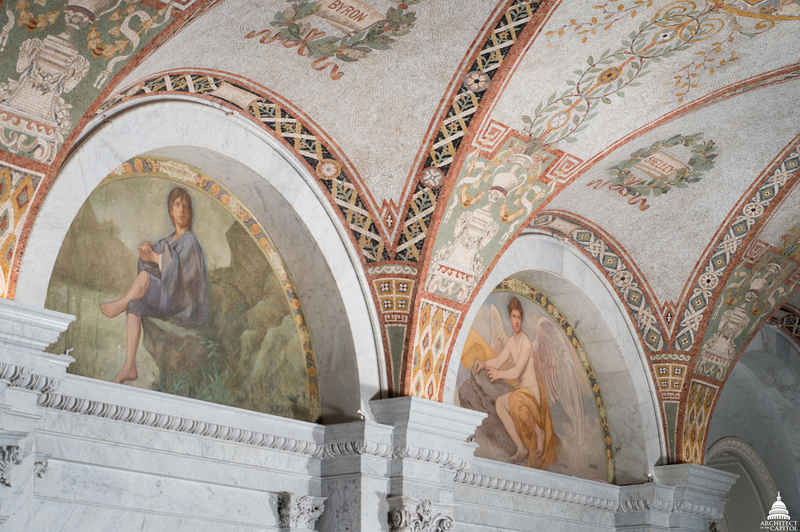 On the second floor of the West Main Pavilion, piping for the sprinklers was hidden in the interstitial space above the vaulted gallery ceilings and the sprinkler head covers were custom painted to match the historical paintings, sculptures and architecture. Many visitors have no idea that this collection—and more importantly, life-saving feature—is tucked away among the priceless art above their heads. 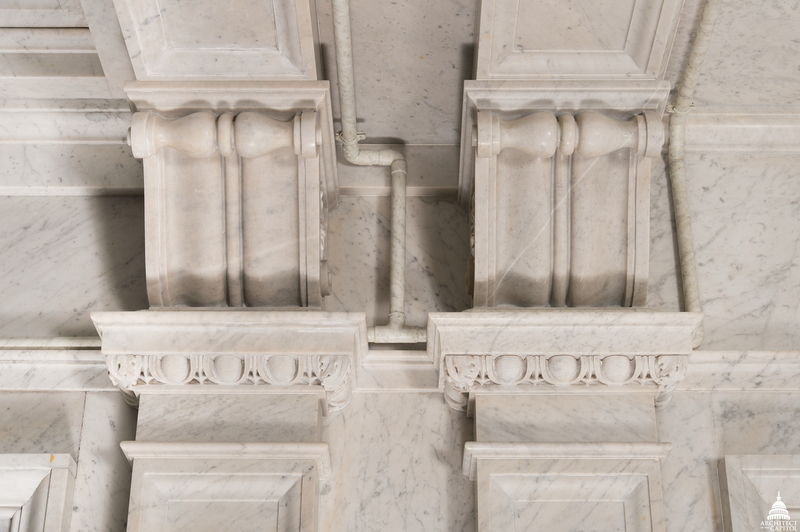 On the first floor, piping for the sprinklers was custom formed to follow the marble arches throughout the space and then faux painted to ensure the art and building elements remained in the forefront of visitors' experiences. "As the collection expands, the Library continues to partner with the AOC to maximize existing building space and look for opportunities to acquire and develop secure and conditioned storage space. These spaces will require special considerations to ensure long-term preservation," said Brown. Fire prevention and protection has come a long way since 1814. Modern technology enables the AOC to take precautions and prevent potentially harmful fires from again ravaging our nation's treasures. Bravo Zulu! Great article and an excellent example of the attention to detail that our guys strive for. Thomas Jefferson was instrumental in shaping the Constitution, and spoke at length at several meetings to expound on the intricacies of the philosophies being implemented by the founding fathers. He was considered not only one of the best read, but also one of the top brilliant minds in the founding fathers. Thank you for this subject matter. It's inspiring. Interesting to learn about things we may not notice but are important. Thank you, Erin!